The Quilt Alliance brings together a vital, active network of individuals and organizations nationwide including, but not limited to, quiltmakers, guilds, historians, folklorists, archivists, corporations, quilt shops, museums, collectors, universities, and families. This network includes you. As an alliance, we seek to celebrate and preserve quilts’ art and history, and the creativity of quiltmakers both in the past and present. Membership dues and contributions make up over 60% of our frugal operating budget and enable our mission unlike any other single source of support. You can choose from one of the membership levels below or simply make a donation of the dollar amount you choose. All memberships are renewable annually and tax-deductible. Contact QA Office Manager Debby Josephs if you would like to check the status of your membership. 33% off pricing for Quilt Story Road Show events (already built-in to Road Show pricing). Placement of group logo and link on our website. Two free banner ads in our newsletter per year. Thank you to Joe Cunningham (Joe the Quilter), our April StoryBee guest), Raymond Houston (Nacho Grandma’s Quilts), and to our friends at Quiltfolk for the exciting membership incentives and drawing prizes this month! 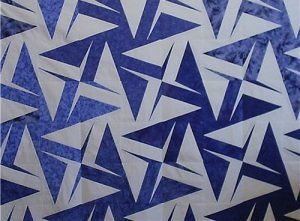 Join or renew in April to receive a free copy of Raymond K. Houston’s LOLLOO PDF quilt pattern. Make your membership payment online, by mail or by phone and we will email you the pdf pattern as our special Thank You Gift. 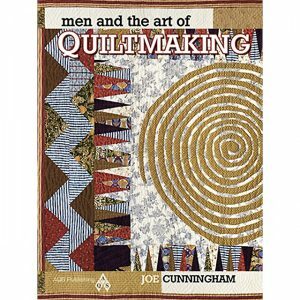 Men and the Art of Quiltmaking (2 copies) by Joe Cunningham (the book includes Raymond K. Houston’s quilt LOLLOO). Info. 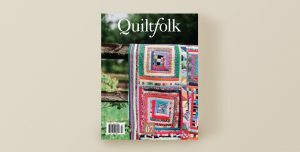 Quiltfolk Issue O7: Louisiana. Info. 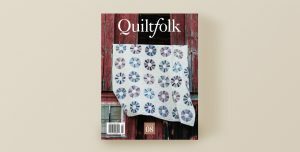 Quiltfolk Issue 08: Michigan. Info. On February 14, 2018 the Quilt Alliance introduced StoryBee, a new interview show created exclusively for our members. It’s a way for us to say “thank you!” to our members and to come together to enjoy stories from prominent quilt lovers across the country (and the world). Why StoryBee? Just like you’d bring your best thimble and your best stories to a quilt bee, we want to bring you little slices of life from across the quilt world. The web-based interview show profiles notable people who make, collect, sell, study, exhibit and/or preserve quilts. In keeping with the Quilt Alliance mission to document, preserve and share the history of quilts, StoryBee records conversations with people from all corners of the quilt world, touring their workspace and finding out what’s on their minds. QA members can watch the videos at their convenience by logging into a new Members-Only Corner on the QA’s website (all current members receive emails when new content is available and/or when they join/renew). Watch the first StoryBee episode below, or click on the video to watch it in YouTube. You can also find teasers for all StoryBee episodes on our YouTube channel.